The study of twins is used to investigate the genetic contributions to physical features and diseases in human. Monozygotic (MZ) cotwins share the same genes, whereas dizygotic twins (DZ) on average share only half of their genes. Therefore, by assuming that both types of twins have been sampled from the gene pool and that similar environmental factors set upon them, one can estimate the relative contributions of genetic and environmental influence to observed variations in different features or traits. Twin researches have indicated a strong genetic component to many dental traits., Horowitz et al., Goodman et al., and Finn and Caldwell  indicated that dental caries has a genetic component. Studies on dental spacing and alignment by Corruccini and Potter  and number of teeth by Markovic  and Townsend GC  indicated a greater influence in MZ twins due to similar genetic makeup when compared with DZ twins. Very few researches of twins among the Indian population have led to this study, highlighting the research design, to further shed light to understand the role of genes in health and science. The purpose of the study is as follows: first to calculate the dental caries experience score, second to figure out the dental anomalies such as spacing, crowding, tooth irregularity, overjet, and dental malocclusion, and finally, to morphometrically analyze the mesiodistal width of canine and to compare the selected parameters in MZ and DZ twins. A cross-sectional study was undertaken after obtaining ethical clearance from the institutional review board. Thirty twin pairs of which 17 were MZ and 13 were DZ in the age group of 15–30 years were selected for the study. Zygosity was determined using medical records, details about chorionicity, and number of placental cords. Twin pairs who had at least twenty permanent teeth, with all the four canines present in the mouth, were included, and those undergoing orthodontic treatment, periodontal problems, and developmental anomalies such as cleft lip and cleft palate were excluded from the study. Informed consent was obtained from the participants before the study was started. The dental caries status was recorded using Decayed Missing and Filled Teeth (DMFT) index, Dental anomalies such as crowding, spacing, diastema, maxillary and mandibular irregularity including overjet and open bite was recorded with the help of CPITN probe. The mesiodistal width of all the four canines and the intercanine distance of the maxilla and mandible were measured using a digital vernier caliper which has been calibrated with an error of ±0.01 mm for the MZ and DZ twins. The mesiodistal width of each canines was recorded thrice and the mean of the three values was taken as the corresponding mesiodistal width of canine recorded. A pilot study was carried out before the start of the study to calibrate the examiners. The parameters included in the study were recorded for twenty voluntary participants individually by the examiners. The kappa value was found to be >96%, indicating an almost perfect agreement between the examiners. The data were entered into Microsoft Excel, and statistical analysis was performed using SPSS version 16 software. The Chi-square test was done to discover if there was an association between the two categorical variables. Two-way ANOVA was used to compare the mean difference between MZ and DZ groups that have been split on two independent variables (zygosity and twin order). Pearson's correlation was carried out to determine the correlation between MZ and DZ twin pairs. Significance level was set at 0.05. Concordance rate was done to check the probability of twin pairs who have common dental parameters. Heritability estimate was also calculated. The present study was carried out among thirty twin pairs, of which 17 were MZ and 13 were DZ. [Table 1] and [Table 2] show that with contrast to DZ twins, MZ twins showed within-pair resemblance in decayed, DMFT and molar relation. [Table 3] and [Table 4] show that no factor has significant mean difference between MZ and DZ twins. 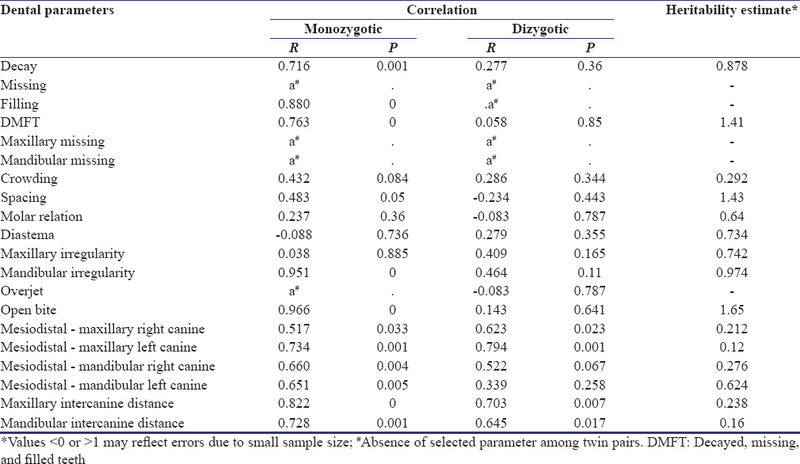 From [Table 5], it is observed that decay, filling, DMFT, spacing, mandibular irregularity, open bite, and mesiodistal width of the right and left canine showed a higher positive correlation in MZ twins than DZ twins. Heritability estimate was found to be low for parameters mesiodistal maxillary left and right canines, maxillary and mandibular intercanine distance, and crowding. 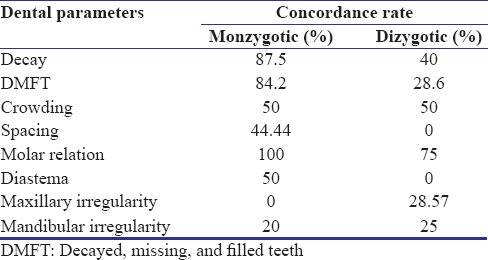 [Table 6] shows the existence of genetic dominance in decay, DMFT, spacing, molar relation, and diastema. Twin studies have long been used to untangle the influences of genes and the environment on particular traits. MZ twins share all their genes, while DZ twins share 50% of their genes. If a characteristic is more common among MZ twins than DZ twins, it indicates that genetic factors are greatly influenced. Conversely, environmental factors will reduce the concordance in MZ twins <100%. Interpretation of twin studies has gained importance with dental literature following genetic correlation than heritability estimates and concordance rates. If a study of twins shows higher intrapair correlations in MZ than in DZ twins, it suggests that heredity may play a role and that it may be worthwhile to search for genes. However, it does not constitute proof and the estimate may be off. Although a great effort was made in the present study to determine the exact heritability, it actually does not tell us which environmental factors influence the parameters. Thus, sticking to genetic correlation alone will tell us which parameters have a greater genetic influence. The most significant finding in the present study is the greater correlation seen in MZ twins than the DZ twins in decay, filling, DMFT, spacing, mandibular irregularity, open bite, and mesiodistal width of the right and left canines. Heritability estimates also showed a strong influence in all the above factors, except the mesiodistal width of maxillary canines and mandibular right canine. Concordance rate again showed a lowest resemblance in maxillary and mandibular irregularity. Genetic diseases in human can be categorized as Mendelian diseases which are caused by variations in a single gene and a complex disease which is caused by an interaction between genetic and nongenetic factors. Dental caries is a complex disease with a known genetic component. Boraas et al., first reported the existence of a genetic component to dental caries, which is also being proved in our study with higher concordance rate (87.5%), correlation (71.6%), and heritability (87.8%). Several genetic variable factors such as oral flora, tooth morphology, tooth eruption time and sequence, arch shape, tooth spacing, and diet have been found to cause dental caries., However, the genetic basis of this still requires further investigation. Twin studies ,, have shown that genetic and environmental factors play a major role in the development of malocclusion. This study also supports the theory with molar relation being highly significant within the MZ twin pairs (P < 0.05) and with a 100% concordance rate. The decrease in the correlation rate in MZ twins than the DZ twins might be a factor to consider that environment too has a role in developing malocclusion. This study showed a marked resemblance in mandibular irregularity (heritability estimate 95.1% and correlation 95.1%), maxillary intercanine distance (correlation 82.2%), mandibular intercanine distance (correlation 72.8%), and open bite (correlation 96.6%) only. Contradictively, the heritability estimate was found to be low in maxillary and mandibular intercanine distance and >1 in open bite which might be due to the smaller sample size. Diastema and spacing have found to show modest heritability and DZ correlation rates (spacing 44.3% and diastema 35.5%), suggesting that though malocclusion is genetic, there can be environmental factors that influence other occlusal parameters to cause malocclusion. Kabban et al. and Boraas et al. suggested a strong inheritability factor to tooth morphology and recommended the usage of tooth size for zygosity determination. The results of this study showed that the mesiodistal width of all canines within MZ twins were not statistically significant (P < 0.05). Pearson's correlation was found to be significantly higher in MZ twins than the DZ twins, indicating that the morphology of canines can be used as a supplementary tool to determine Zygosity. In conclusion, our study has shown that most of the dental parameters are significantly heritable, with up to 85% of the variance being attributable to genetic factors in some cases. However, environmental factors also play a major role in developing malocclusion and causing dental caries. Townsend G, Hughes T, Luciano M, Bockmann M, Brook A. Genetic and environmental influences on human dental variation: A critical evaluation of studies involving twins. Arch Oral Biol 2009;54 Suppl 1:S45-51. Bouchard TJ. Do environmental similarities explain the similarity in intelligence of identical twins reared apart? Intelligence 1983;7:175-84. Nakata M. Twin studies in craniofacial genetics: A review. Acta Genet Med Gemellol (Roma) 1985;34:1-4. Horowitz SL, Osborne RH, Degeorge FV. Caries experience in twins. Science 1958;128:300-1. Goodman HO, Luke JE, Rosen S, Hackel E. Heritability in dental caries, certain oral microflora and salivary components. Am J Hum Genet 1959;11:263-73. Finn SB, Caldwell RC. Dental caries in twins – I. a comparison of the caries experience of monozygotic twins, dizygotic twins and unrelated children. ArOral Biol 1963;8:571-85. Corruccini RS, Potter RH. Genetic analysis of occlusal variation in twins. Am J Orthod 1980;78:140-54. Markovic M. Hypodontia in twins. Swed Dent J Suppl 1982;15:153-62. Townsend GC, Richards L, Hughes T, Pinkerton S, Schwerdt W. Epigenetic influences may explain dental differences in monozygotic twin pairs. Australian Dental Journal. 2005;50:95-100. World Health Organization. Oral Health Surveys: Basic Methods. 5th ed. Geneva: World Health Organization; 2013. World Health Organization. Oral Health Surveys: Basic Methods. 4th ed. Geneva: World Health Organization; 1999. Crusio WE. Heritability estimates in behavior genetics: Wasn't that station passed long ago? Behav Brain Sci 2012;35:361-2. Werneck RI, Mira MT, Trevilatto PC. A critical review: An overview of genetic influence on dental caries. Oral Dis 2010;16:613-23. Boraas JC, Messer LB, Till MJ. A genetic contribution to dental caries, occlusion, and morphology as demonstrated by twins reared apart. J Dent Res 1988;67:1150-5. Martinez-Mier EA, Zandona AF. The impact of gender on caries prevalence and risk assessment. Dent Clin North Am 2013;57:301-15. Chandra HS, Krishnamoorthy SH, Savitha NS, Thottathil AA. Assessment of genetic and environmental contribution to malocclusion and craniofacial complex: A case study of twins. Ann Essences Dent 2015;7:1-6. Kabban M, Fearne J, Jovanovski V, Zou L. Tooth size and morphology in twins. Int J Paediatr Dent 2001;11:333-9.